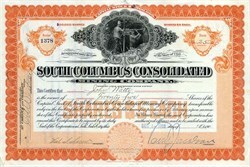 Beautifully engraved certificate from the South Columbus Consolidated Mining Company issued in 1908. 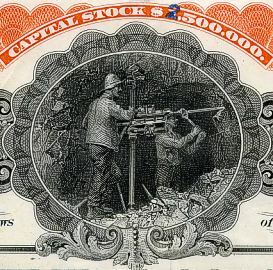 This historic document was printed by the American Banknote Company and has an ornate border around it with a vignette of two miners working underground. This item has the signatures of the Company’s President, Tony Jacobson and Secretary, Val S. Snow and is over 101 years old. Tony Jacobson, Mining, Salt Lake City, Utah, was born in that city September 2, 1869, the son of Anton Jacobson and Matilda (Norene) Jacobson. He married Annie Sherwood Motsch, September 7, 1892, at Pioche, Nevada. They are the parents of seven children, Adelina. Alex J., Katherine M., Fratikie, Mamie, Antoinette and Alta Jacobson. Mr. Jacobson numbers among the successful men of the Great West who may be termed self-made. He was denied the advantages of an education in his youth and has taught himself as he went through life. When he was a boy ten years of age he went to work on a farm in Utah and for the next four years was engaged in that line of work. Then began mining and learned the business in its every phase, going from the smallest position in the mine to the post of Superintendent. He was employed for the most part in Utah, but also worked in other States. All the time he was working in the mines Mr. Jacobson was studying to perfect himself in business methods and when he reached the age of thirty years was able to take his place among the leaders of his community. Leaving his mine labors as an employe, in 1899, he went into business for himself and for three years, or until 1902, operated properties at Alta and Stockton, Lrtah, under leases and bonds. He prospered in this field, due as much to his executive ability and managerial methods as to his practical knowledge of mining, and in 1902 had earned a financial standing which enabled him to organize a company of his own. In that year he incorporated the Columbus Consolidated Mining Company, and has been director and manager of it ever since. This company acquired valuable mining property in the State of Utah and was the basis of one of the most extensive mining syndicates in that part of the country. He is at present president and director of the company also. Four years after the formation of the original company. Mr. Jacobson organized the South Columbus Consolidated Mining Company, and the success of his first venture made him the unanimous choice for manager of the new concern. He was manager and director of it until 1910, when he surrendered the reins to others. The same year of that company's start, Mr. Jacobson brought into existence what is known as the Columbus Extension Mining Company, and, a* in the case of the others, he became manager and director and is today president of it. The fourth company of which Mr. Jacobson was the originator was the Alta Consolidated Mining Company, started in 1911, and of this he is also president and manager. The combined holdings and capital of these several companies run into large figures and Mr. Jacobson is the principal factor in their operations. He personally looks after the business of each and it is due to his expert knowledge and careful direction that they are successes.. All of the companies are on a paying basis and Mr. Jacobson recognized as the impelling force, in their conduct, is ranked among the most capable mine operators in Utah. Despite his activity in the management of his various interests, Mr. Jacobson has found time to aid in the development of his native State and has done many things for the civic betterment of Salt Lake City. He is a member of the Commercial Club of that city, an institution which has taken the lead in many measures for the improvement of the municipality, and has served on many of its progressive committees. With his time practically all taken up with his business interests, Mr. Jacobson has had little opportunity for play and as a result he does not belong to many clubs. His only social affiliation is the Alta Club of Salt Lake City.